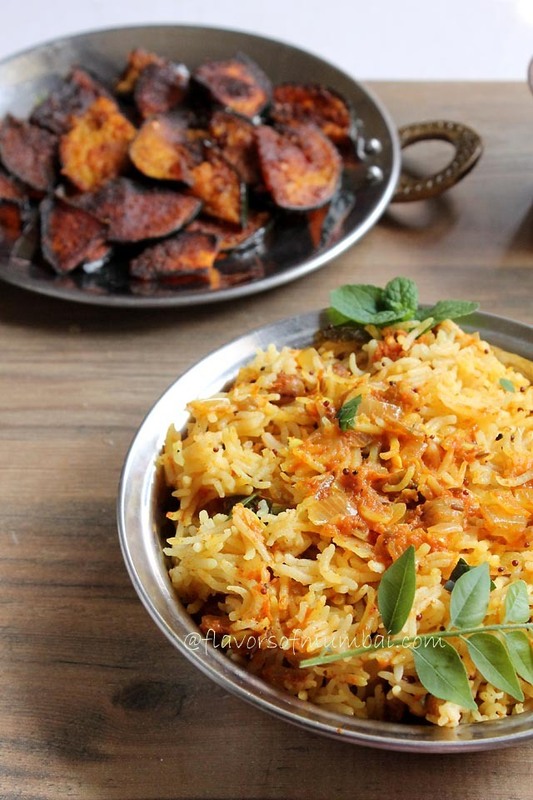 Simple, healthy and easy to make Tomato Rice Or Thakkali Sadam! After Goan food South Indian food comes naturally to me. Had loads of tomato at home last weekend. As usual hubby was hungry and all I had were tomatoes at home. So I just thought of making tomato rice with basic ingredients found in your kitchen. There are lot of versions of tomato rice. However this is my own version. I have pureed the tomatoes added some spices and ground nuts for crunch voila tomato rice Or pulao is ready. Generally I use normal organic kolam rice for pulao. But since I had to click pictures I have used basmati rice. You could use any rice you wish. So when you don’t know what to make this is the best dish to make. I usually make Tamatar chutney at home with rotis. But this recipe is too good. It’s easy to make and can be made instantly. I have tried many recipes with tomatoes like Indian Tomato Chutney, Tomato Soup with vegetables, Homemade Tomato Pizza Sauce and Dahi Kadi Recipe with Tomatoes. 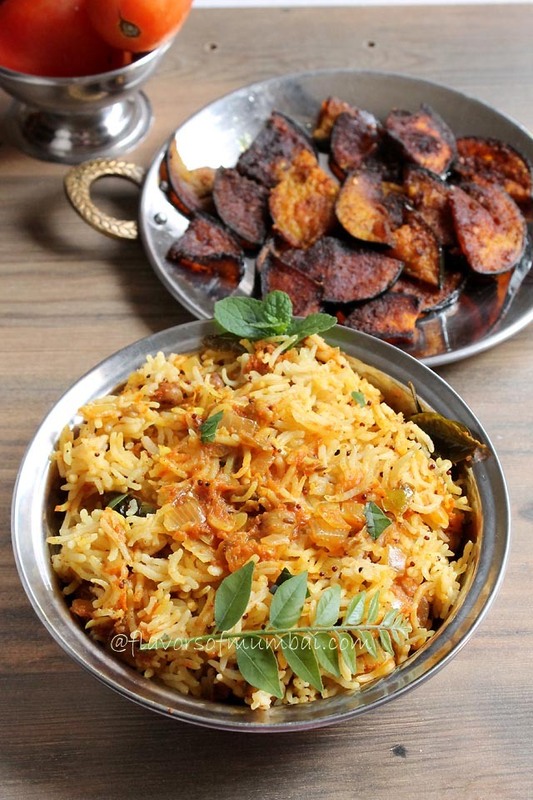 Club the tomato rice with papad, pickle Or vegetable. We ate ours with papad and brinjal fry. Nowadays I am on spree of vegetarian food hence loads of veggies. Also will soon post fasting recipes and some Indian desserts. Also non vegetarians don’t worry will soon bounce back with great non veg recipes. Use ratio of 2:4 for cooking rice always i.e if 2 cups of rice then 4 cups of water. But if you are using vegetable puree, curd Or any liquid then reduce the quantity of water and add accordingly. Else your rice would be mushy. I have used groundnuts you could use cashewnuts instead. Firstly soak rice in water for 10 mins. Meanwhile chop tomatoes. Grind all of them into a processor until they are smooth puree. Chop onions and keep all the ingredients ready. Take a cooker Or pan add oil. Once oil is hot add mustard seed, asofoetida, cumin seed, fenugreek seed, curry leaves, mint leaves and sugar. Put ginger-garlic paste and stir for 30 secs. Now add tomato puree and stir nicely. Add all spices like turmeric, red chili powder, garam masala powder and roasted cumin powder. Cook for 3 to 4 mins add water to it. Finally add black salt, tamarind pulp and soaked rice. Pressure cook until 3 whistles Or cook them in a pan with lid until rice is cooked. If you feel water is less add more water. The ratio should be 2:4 if using 2 cups of rice then 4 cups of water. However we are also using tomato puree so add water accordingly. 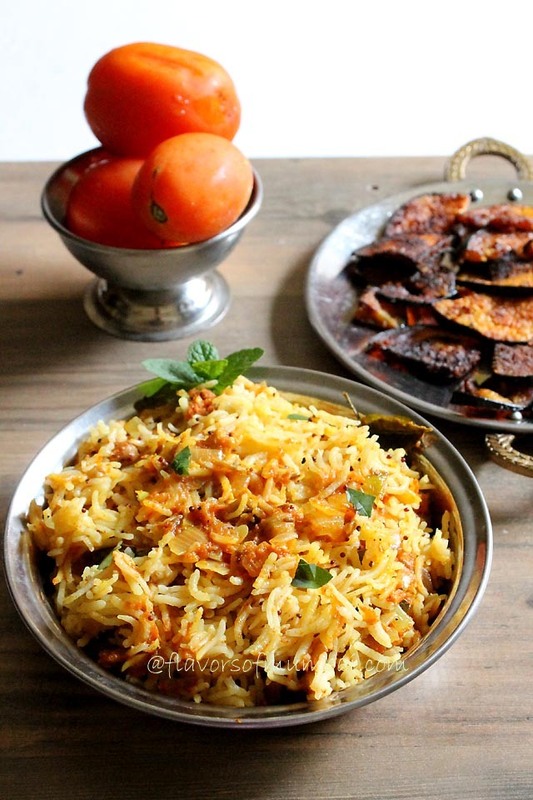 Serve tomato rice with papad Or pickle. Thankyou Savita 🙂 for trying and I am glad you liked.